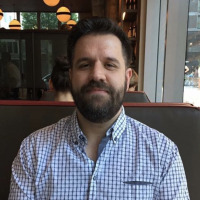 One of the best things about buying digital books is that they can be updated after the initial publishing, and it usually doesn’t require buying a new version to get the latest updates. Kindle books are updated all the time, but you might not know unless you check. You’ve probably bought a Kindle book from a famous author, and eventually received an email from Amazon letting you know that there’s a new version out there with updated content, even though half the time it’s just a bunch of fixes and small changes. For the rest of us who aren’t famous, it’s a little different. 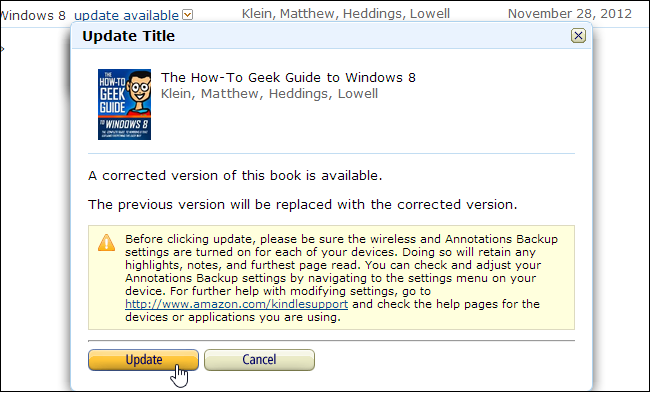 When we publish a new update, like we have done 5 times with our How-To Geek Guide to Windows 8, we have to manually request for Amazon to update the existing purchasers with the new version, and they won’t get an email. You might wonder why Amazon doesn’t just update everybody with the new version all the time, and the reason is simple: because you can add notes and annotations to your Kindle books, when a new version is released, those notes probably won’t apply to the updated version, and that would cause problems. So you have to choose to “install” updates to the book. It makes sense, though it’s not the most convenient thing ever. All you have to do is head to the Manage Your Kindle item on the Amazon menu (shown above) and then click the “update available” next to any book that has an update. Then click the Update this title now link. You’ll be shown a confirmation that explains about the annotations, which you should read carefully if you use them. If you don’t, click Update. It’s probably worth mentioning that there’s an update to our Windows 8 guide. Of course, if you haven’t bought the book yet, you’ll get the very latest version when you do.